Spending the night under the desert stars is the best way to experience and appreciate Zion's open backcountry: the vast expanse of land, the variety of terrain, and the incredible beauty the park has to offer. 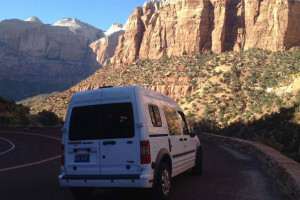 Permits may be obtained through the online reservation system or by visiting the Zion Canyon Backcountry Desk. Reservations are available 3 months in advance. Always carry plenty of water. Spending a night in the Zion Narrows is a chance to take the time to properly appreciate the slot canyon's unique characteristics. Do something a little more on this trip. Take everyone away from the TV, cell phones and video games to spend a night out in the Zion backcountry. Hike a few miles in, setup camp, and marvel at the natural carvings all around. Get your water right out of the spring - nature's tap water. There are twelve designated campsites in the Zion Narrows that provide the chance to experience the 16-mile hike down the popular canyon at a leisurely pace. Make reservations early, because this one fills up fast! After the Zion Narrows, the West Rim Trail is the most popular spot to spend a backcountry overnight. Hike up to Cabin Springs from The Grotto or down to Potato Hollow from Lava Point for a quiet night under the stars. The one-way trek from Lava Point to The Grotto is another popular overnight trip. There are a large number of campsites to choose from along La Verkin Creek Trail, mostly around Kolob Arch. This makes for a good base to explore Bear Trap Canyon or Upper La Verkin Canyon, in addition to seeing one of the world's largest freestanding arches. The terrace between Kolob Canyon and Zion Canyon has some of the most remote and inaccessible land in the park. But if true backcountry is where you want to go, this is it. There are few trails, no designated campsites, sparse water and nothing but open, rugged land. Comprised of Coalpits Wash, Scroggins Wash and Chinle Trail, this is a chance to explore the lowlands section park, often overlooked by visitors. Easily accessible from the trailhead, a night out in the desert will be an experience to remember. 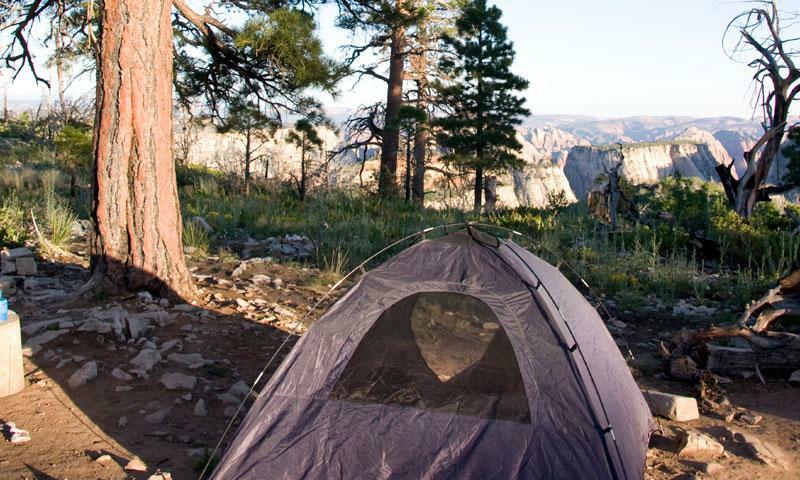 With the exception of South and Watchman Campgrounds, camping overnight requires a backcountry permit, which can be reserved in advance for $5. Permits are limited for some popular routes, but at least 25% of these are reserved for walk-ups. Arrive early to get your permit if starting a popular route. Permits are $10 for 1-2 people, $15 for 3-7 people and $20 for groups from 8 to 12 people. The most popular time to visit Zion is summer, when the weather is the hottest and driest. Always bring plenty of water, at least one gallon per person per day. If using water from a stream or pool, be sure to purify it by boiling, filtering or chemically treating it. Winter presents its own set of difficulties, with ice and snow to be expected. Crampons are recommended gear if heading onto any steep trails, and be sure to bring plenty of layers to adapt to the changing weather conditions. Flash floods are serious hazards, generally in spring, summer and fall. The sudden change in water flow can be dangerous, even fatal. Always check with the Park Rangers for flash flood warnings. If a stream quickly changes color or starts to rise, immediately search for safety in higher ground. Learn how to recognize hypothermia, heat exhaustion and heat stroke. If expecting to do any canyoneering or other sports that require ropes or equipment, be sure that everyone in the group has the skills and experience necessary. Observe and follow all posted signs. Carry your permit with you at all times. Always stay on the trail and camp in previously used sites. There are no fires permitted in the backcountry, so plan on using a gas stove for any cooking. If possible, human waste should be placed in a disposal bag. This is a requirement in the slot canyons such as Zion Narrows. When camping in an open area, setup camp 100 feet from water, a quarter mile from springs, and one mile from roads.